Charles Payzant biography provided courtesy of �California Watercolors 1850-1970� By Gordon T. McClelland and Jay T. Last. CHARLES PAYZANT (1898-1980)...Born: Halifax, Canada. Studied: Victoria School of Art (Halifax, Canada), Chouinard Art Institute (Los Angeles), Otis Art Institute (Los Angeles). Member: American Water Color Society, California Watercolor Society. St. George Charles Payzant, as his birth certificate reads, was born and raised in Nova Scotia, Canada. After serving with the 193rd Nova Scotia Highlanders and the Royal Flying Corps in World War I, he received art instruction in England and Canada. In the early 1920s, Charles moved to Los Angeles and continued his art education at the Otis Art Institute and the Chouinard Art Institute. By the mid 1920s, he was a freelance commercial artist, producing illustrations in watercolor and line art. Payzant also began producing fine art watercolors painted on location around Los Angeles. His background in illustration was apparent in many of these works and gave them a quality unlike what most of the California watercolorists were producing. They were very early examples of what would later be known as the California Style of watercolor painting. In 1930, Charles Payzant began exhibiting these works in the California Water Color Society shows and as the younger artists were developing their style, he was refining his already developed approach and was winning a number of awards. Payzant painted on location and often chose to depict city street scenes with people, cars and buildings. His approach to watercolor painting was direct and confident. One of his close friends and painting partners during this period was Hardie Gramatky. Charles Payzant biographical information: Interview with Terry Shannon Payzant, 1983. 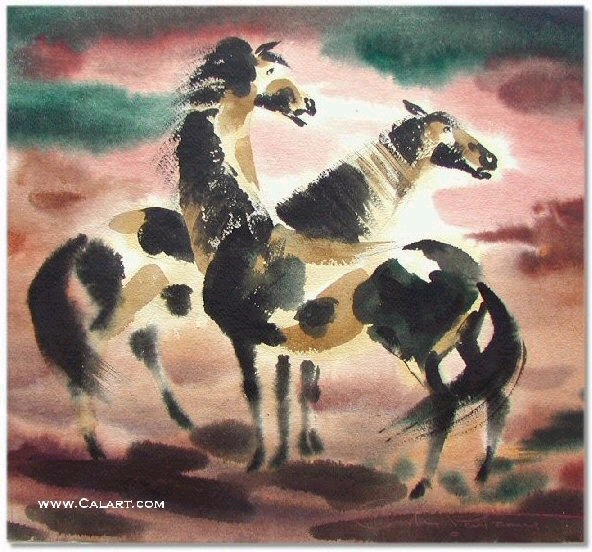 Original Painted Ponies w/c by California Watercolorist Charles Payzant. Painting is signed lower right & titled on back "Painted Ponies". Watercolor measures 17" x 17" & is in Pristine Condition.